You need 8k d-v. Now you don't even need mods to know if you have enough. Hmmm. But maybe it was 8k in vacuum, on the surface it could be much less, depending on used engine? It’s probably your ascent trajectory. Launching from Eve is not like launching from Kerbin. You need to go pretty much straight up until at least 20km in order to get out of the dense lower atmosphere. That’s going to take a lot more than 8k delta-v. You’ll need to be pitched over to the horizon before you leave the atmosphere. You can save a lot of dV by landing in the right place on Eve. I would recommend using autostruts set to grandparent part instead. They help with structural rigidity without contributing to drag or mass. You need ‘advanced tweakables’ turned on in settings to get them. With some testing, and patience, it's not that hard. I mean, it's difficult, but do able. 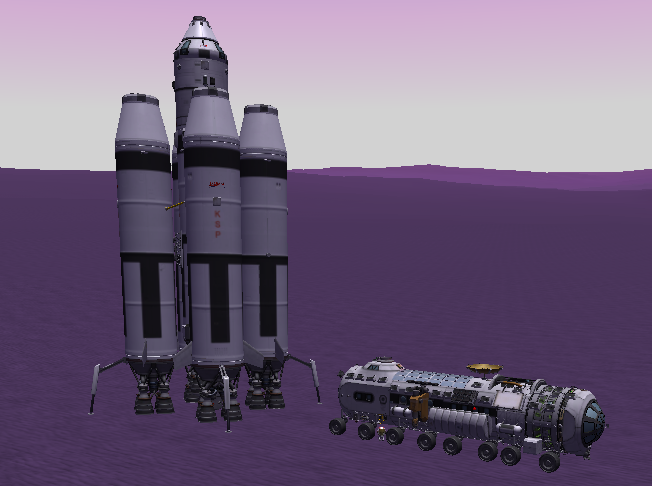 In this pic, the 6 man return vehicle landed on it's own, empty, and the rover with the crew landed somewhere else, drove to the lander, refueled it, and then they went home. But it would be pretty trivial to change the design a bit to have the ISRU under the lander, and have it drop off during launch. Oh I hear that. I prefer designing my own. But sometimes I have to look at what others have done in order to get the correct inspiration for my designs. I tend to prefer reusable interplanetary motherships over one and done single use vessels, so when I was building this, the only thing I cared about was getting back to orbit, with enough dv to dock. You don't need 8k dV to make orbit from sea level of Eve. The least I've done it with is around 5.8k dV. The reason a lot of craft need more is because drag losses are so high in Eve's souposphere. You need to reduce drag as the priority. That means: dropping absolutely anything not essential for reaching orbit, really minimising the payload and removing anything at all that adds any drag. As well as having the slimmest design with the smallest number of stacks. 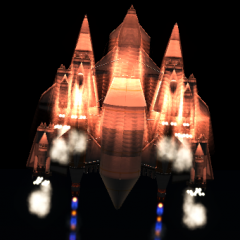 I also recommend using the Gravity Turn Continued mod when testing a craft so that you can tweak and repeat a launch with the same profile each time so that you know its a changes to the craft that is changing how much dV you are falling short of and when there are improvements due to a design change. Once you have optimised your craft this way "in the simulator" you can fly it for real as a mission. You picture link doesn't work btw. That's only useful if your craft is draggy. If you make a little craft with very low drag then it becomes efficient again to start the turn much lower. The key though being to have a zero AoA to minimise drag. It also depends on your engines, some get really bad Isp at 5 atm, and the difference between sea level and vacuum is worse than on Kerbin. DRAG DRAG DRAG that thing is draggy. Most importantly, it's draggy on the top so wants to fly backward. Parachutes? Decouple them. Top of the pod? Cap it. Fuel ducts? Lose 'em and use cross-feed. Wings? Too high. I'd drop them myself and use the Vectors for steering and stability. And leave the gimbal at 100. You WANT lots of gimbal. But literally any upward facing surface without a nose cone will kill you. Downward facing (engineless) ones will hurt too. @Reinhart Mk.1 One engine isn't running. Clearly visible in the staging list. At 1:42 I see that it's one of the asparagus engines -- hence the flip. You'll get a lot of flak for carrying legs and parachutes and whatnot. My main concern when looking at that vessel is that it's a lot of engine for very little fuel. Like, 1/2 of your vessel mass is engines -- and powerful Vectors to boot. You're certainly not short on TWR. For comparison, here's my one-person thingy. Please note that the lifter proper is just the 9 parts in the middle, all the rest was for getting to Eve in the first place. Well I think I can offer a a few observations here. The reason you are flipping out on takeoff is that you are missing an engine on the back side of your craft! You can clearly see it in the indicator on the staging sidebar as well. If you set the thrust limiter on the opposite engine to zero, you should be able to take off more or less vertically. That's because you also have really excessive TWR with all those Vectors on such a small lander. Also, your total dV indicator on the sidebar reads only 2.7 km, which is not enough if it's true, and if it's not it means something in your staging sequence is out of whack. I'm inclined to believe it's more or less true, because you are apparently taking off like a shot with a missing engine and the others set to half power. An efficiently designed Eve lifter will take off in a stately fashion at full throttle, gaining speed at only around 2-3 m/s/s right at the start. But literally any upward facing surface without a nose cone will kill you. I was going to make that comment as well, but on closer inspection I saw that he had circular intakes on top of his stacks, which actually mitigate drag pretty effectively. That's interesting. I hadn't realized the lower boundary was quite that low. Is that straight vacuum dV? Eve landing and return is the 'final boss' of the stock game. I understand the sentiment, though. I wrote a little parody of a song some time ago a﻿﻿bout the difficulties of Eve. There is no way a sea level Eve ascent is possible with only 5.8km of vacuum dV. Even as actual atmosphere-adjusted dV that claim seems pretty iffy to me. That's because if Eve had no atmosphere, you would need to expend at least around 4 or so km/s of vacuum dV just to get going fast enough to stay in orbit. And that's only if you take off horizontally in vacuum, accelerating to that speed instantaneously, i.e. that is a hard theoretical limit and not any kind of practical one. And even setting that aside, there is no way you are pushing anything that size through all that soup for just an extra 1.8km/s over that limit. If however what we are talking about what the dV indicator says when you are sitting on the ground, then that sounds about right. You can see that the dV indicator reads 5.3 km/s while it's descending through the upper atmo, but reads only 1.4km/s when it's near the ground (OK, that particular time it actually went in the Drink, but that's beside the point!). Its actual vacuum dV when staged as intended is something like 12km/s, and configured as shown it makes Eve orbit from sea level with around 2km/s dV to spare in low TWR orbital maneuvering ability. ....So I've now gone on to test the minimum suicide burn dV myself by hacking the Eve atmo with HyperEdit. At the lowest normally safe orbit of 91km, I was going 3215 m/s. To drop my PE to 1600m, I had to lose exactly 100m/s of velocity. When I hit terrain at 3km, about 90 seconds before PE, I was going 3554 m/s. At the rate I was accelerating, I estimate that if I had made it down to 1000m I would have been going around 3580 m/s. Adding it up, I find that to attain the lowest-energy safe orbit possible from the surface of Eve, an absolute minimum of 3680m/s is required.